Compassionate, generous Wayan grew up in a traditional family in Bali where all meals were prepared entirely from scratch from local ingredients. She showcases her culinary heritage by cooking authentic Balinese dishes prepared with the traditional cooking methods of steaming, grilling and braising over a wood fired stove. Wayan uses her expertise in the kitchen to coax surprisingly complex flavors from simple ingredients. This is real Balinese cooking at its best. 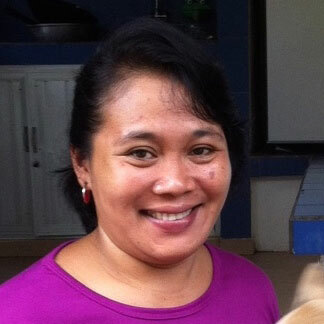 Wayan Manis ("Sweet Wayan") lives with her husband, parents-in-law, and two school-age children in a traditional family compound ten minutes from Ubud. They have several pet dogs and also keep chickens, birds and pigs in the back. 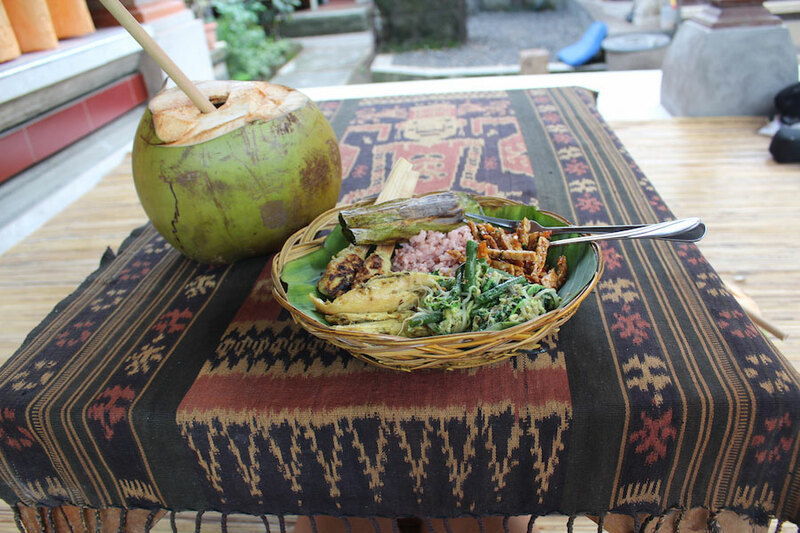 In-home meal: (1-4 guests) Join Wayan for an authentic Balinese dinner prepared using traditional cooking methods on a wood fired stove. She will explain the ingredients, various cooking techniques and the heath benefits inherent in the herbs, roots and spices she uses to flavor her dishes. Wayan prepares everything from scratch, by hand. Your meal will feature the freshest seasonal produce and fragrant home-made spice pastes. You will taste a range of dishes such as satay ayam or ikan (skewers of grilled, marinated chicken or fish), ayam betutu (chicken stuffed with spices and roasted slowly over a coconut husk fire, pork curry, pepes tofu (tofu and vegetables wrapped in a banana leaf and grilled), urab (a traditional vegetable dish of long beans, local spinach, and bean sprouts flavored with fresh coconut), tempeh manis (a cake of fermented soy beans cooked with red palm sugar and cashews) and red heritage rice. For dessert Wayan prepares traditional sweets made with palm sugar, rice flour and coconut. Cooking experience: (1-4 guests) Enter the kitchen with Wayan to learn to prepare a traditional Balinese meal. During your hands-on cooking lesson Wayan will teach you to prepare 2-3 dishes from scratch. She will teach you to grind fresh spices and aromatics to make flavorful pastes, you will wrap ingredients in banana leaves, and you'll be instructed in the art of steaming rice in a traditional woven basket on top of the own. The food will be cooked on Wayan's wood fired stove and you should be prepared for it to get quite warm as you cook! Your dishes will be served with other foods that Wayan will have prepared in advance. You can expect your hands-on cooking lesson will last about an hour. Wayan's cooking lessons are only offered on Sunday evenings. Notes: Prices include round-trip transport from within 5 miles of Ubud. Please be sure to include your hotel name on the reservation form so your host can arrange for your pick-up. If you are staying outside of Ubud there will be an additional charge for transportation. Please contact us at reservations@travelingspoon.com for details. This was such an amazing experience! Wayan's husband picked us up from out resort in Ubud. When we arrived, we were given fresh coconuts with hand-made bamboo straws. We observed the cooking from muddling spices, to steaming rice, making tempeh, and everything in-between. We then joined the family for dinner in a very nice open dining area. Of course, there was way too much food and they offered to send us back with leftovers. Unfortunately, we had no way to reheat the food at our resort, so they sent us with a ton of fresh fruit, and souvenirs that were hand made by the family business (bamboo straws and sea salt). All of the food was excellent and the family was so kind. Certainly an experience I will never forget! I highly recommend this! Wayan and her family warmly welcomed me into their traditional home. After having lived in Indonesia for 16 years and eating a multitude of different regional cuisines, I found Wayan’s dishes to be distinct, simple and delicious. It was a wonderful way to have more of local experience in Bali, spending the afternoon learning how to cook and indulging in traditional Balinese food. Very few homes in Bali still cook food the traditional way, using an open flame wood-burning oven. It was fascinating to watch her cook all the dishes over the open hot flame, which then added so much extra flavor to each dish! Every bite was incredible, and I love how all the ingredients she used were so simple yet combined created such powerful flavors. After the meal, Wayan gave me a mini tour of her property and showed me where they raise their own pigs, so I got to see two large pigs and several piglets. Since Bali is a Hindu province in Indonesia, the roasted suckling pig (Babi Guling) is an extremely popular and enjoyable dish in the region. We really enjoyed everything about our evening in Ubud with Wayan and her husband: the hospitality and generosity of our hosts, the delicious food, everything we learned about Balinese culture and cooking... It was a wonderful and memorable experience. INCREDIBLE! So much more than I could have ever imagined. Wayan and her family were gracious hosts. The food was delicious and it was wonderful learning how to make authentic Balinese dishes. The whole experience was amazing. I will definitely book Traveling Spoon in other countries.